Here are our unbiased opinions. You’ve been eyeing it, wondering if the benefits outweigh the cost, and if it really works as it claims to—high tech, at-home, electronic beauty tools are all the rage RN. But do you really need one? There use to be a time in the not-so-distant past when at-home beauty devices were the size of a large landline phone (what are those?) and involved nearly a nurse practitioners-level of training and knowledge just to turn the tool on. The times have changed though, and nowadays, beauty devices are very high-tech, palm-sized, and actually easy to use. Dare we say it’s a breeze to zap, pulsate, and electrocute your face now—all in the name of healthier, smoother skin. We tested out six of the most trendy, buzzy, and interesting electronic tools, and here are our (very) unbiased thoughts, opinions, and emotions. Designed to: Minimize fine lines, wrinkles, and pores, stimulate blood circulation, and deeply moisturize—thanks to the powers of galvanic currents in the device, which allow ingredients to go deeper into the skin’s dermis. The ionic enhancer tool slips over a magnetized face mask and is set to the LED light you want to target most—acne, wrinkles, or hydration. It was developed by celebrity facialist Georgia Louise to give similar results as her high-tech, high-end facials, but in the convenience of your own home. Designed to: Honestly, what can’t this tool do? This nanocurrent and microcurrent-powered tool is perhaps the most high-tech device you can hold in the palm of your hand, besides your phone. The patented and FDA-cleared technology tool can dramatically light and tighten muscles, kill bacteria and acne, and encourage skin cells to produce an abundance of collagen and elastin. “This tool is a miracle worker. And it’s founder and creator, celebrity facialist Melanie Simon, is a genius. I use it about two to three times a week to kill zits—and it actually works, I can actually dramatically see the difference when I consistently use it. “I also have a few sunspots popping up, and the tool can target the melanin in those, acting to lighten them. The ZIIP is also known for its ability to dramatically minimize fine lines with microcurrents. And if that wasn’t enough, it honestly can lift up my face with deep-penetrating waveforms that focus on facial muscles, giving an immediate definement and lift to bone structure—the results are dramatic. It’s basically me, but looking well-rested and sans stress or zits. Designed to: Save you time: If you’ve got 90 seconds, you’ve got time for a face mask. Utilizing LED light therapy, “Hyper-Infusion Technology”, and “sonic pulsations” to supercharge a mask with just 90 seconds. “I don’t often find the time to use facemasks on average weeknights. Thus, it was a revelation that this tool could facilitate a quality facemask experience in a hand-held format and in the same amount of time it takes me to brush my teeth. “The face mask pad is a flat surface which makes it a bit challenging to navigate the nose and eyes, but flows easily on the flatter surfaces of the face. The size and feel of the tool were comfortable, and the functionality was intuitive. Designed to: Reduce immediate puffiness, and with overtime usage, minimize undereye fine lines and wrinkles. It only 60 seconds too, which is a major plus. “I sometimes wake up with puffy eyes, so I could see the benefit of using this product over time to help alleviate this problem. 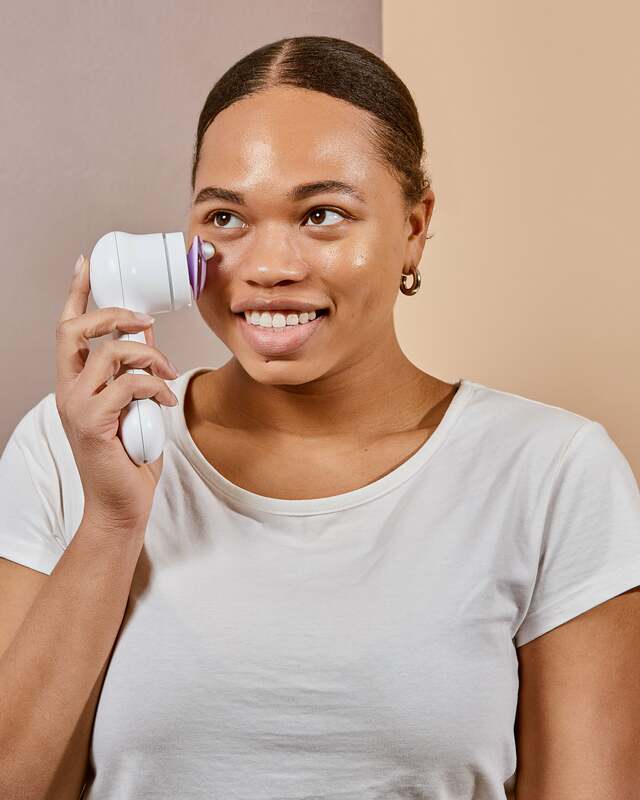 I personally didn’t see a huge difference, but I would recommend it for people who struggle with persistent puffy eyes or wrinkles, and is able to be consistent with the Clarisonic Eye Massager routine. Designed to: Kill stubborn acne and scars. LED light therapy is a standard, very effective tool at dermatologist and facialist offices, but until recently, it was also very pricey. This Neutrogena tool targets zits with the dual action technology of both blue and red lights, which combats both acne and inflammation. “I own approximately 30 different face masks—but ultimately, on lazy days, I can hardly compel myself to apply one, only to have to go through the trouble of removing it 15 or 20 minutes later. That’s why this Light Therapy Mask had an instant appeal: all I had to do was pop it on for 10 minutes after washing my face, and then go about the rest of my routine. “When I first used it, I was shocked at how bright the light was, but after a minute or so, my eyes adjusted and I was able to watch Netflix while the mask worked its magic. Afterward, my skin felt a little dry—almost like I had just used a detoxifying mask—and I went through the rest of my routine, focusing on using hydrating serums and a heavy moisturizer. Designed to: Tone your body, with the first at-home FDA-cleared microcurrent device. It firms quickly with four “spheres” that deliver powerful and targeted microcurrent to anywhere on the body you’d like to minimize the look of uneven or dimpled skin. “When it comes to devices, I’ve always focused on my face, so this is the first time I’ve used any sort of device on my body, especially one with microcurrents. I haven’t seen immediate results after weeks of use, but I’ve found it’s super easy to incorporate into my busy schedule (using it for just a few minutes per day), once you get the hang of the basic moves and how to hold the device.